"This is the perfect simple side dish for a couple of German bratwursts or schnitzel." Place potatoes in a large pot and cover with salted water; bring to a boil. Reduce heat to medium-low and simmer until tender, about 20 minutes. Drain. Sprinkle on parsley and serve hot. Master Butcher Uli serves Lengenberg's Boiled Potatoes with his Onion Bacon Sauce. Try these potatoes with Uli's Apple Red Cabbage too. As recipes go this isn't much of a recipe - but I do have to say, you need more than a pinch of salt when cooking potatoes. I thought it was pretty bland. Would definitely need to be served with something that has bolder flavor. Simple and elegant addition to a meat-centred meal. These never fail me. 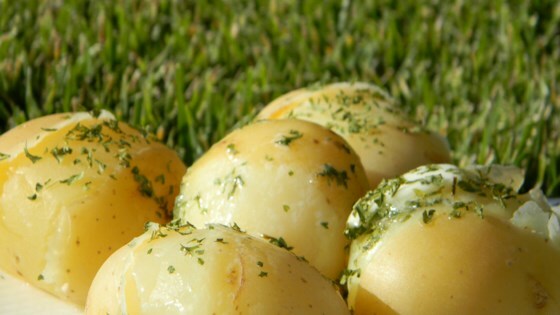 Love potatoes and parsley! Super easy. Very good. Did add butter after draining, just a preference.